Azerbaijan and Russia have signed a number of agreements in Baku on economic cooperation. The documents were signed as part of the visit of Minister of Industry and Trade of Russia Denis Manturov to Baku. In particular, Sumgait Technology Park LLC signed an agreement on cooperation and organization of relations with Rostselmash KZ LLC and a memorandum of cooperation with Transmashholding LLC. This is while AzOkso LLC signed a memorandum of intent to jointly implement fencing systems with ServiceInvest LLC. Baku hosted a meeting of Azerbaijani and Russian entrepreneurs. The event was attended by Azerbaijan’s Economy Minister Shahin Mustafayev, Chairman of the Board of the Azerbaijan-Russia Business Council Samad Gurbanov, Acting President of the Azerbaijan Export and Investment Promotion Foundation (AZPROMO) Yusif Abdullayev, Chief Director of the Russian Export Center Andrey Slepnev. Minister of Industry and Trade of Russia Denis Manturov is in Baku on a one-day visit. 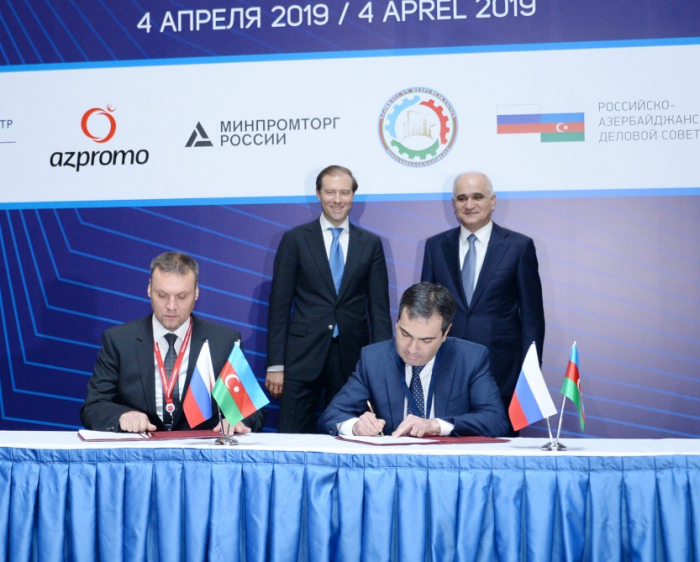 Representatives of more than 60 Russian companies operating in various sectors of the economy, including in the fields of agriculture, ICT, automotive engineering, chemical industry and other sectors, are together with Manturov in Baku. According to Azerbaijan’s State Customs Committee, Azerbaijan’s trade with Russia amounted to $2.55 billion in 2018, including the export of Azerbaijani products worth $665.74 million to Russia.